Those who follow the ultra-luxury segment — both fanboys and the people who can actually afford these things — will recall Rolls-Royce’s 200EX concept, which was unveiled at last spring’s Geneva Motor Show. The Ghost is the production version, and it looks much like the 200EX. 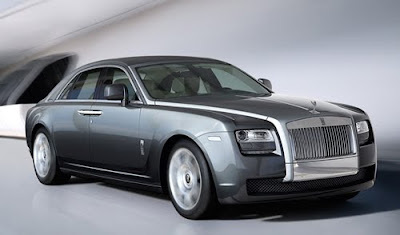 A smaller, less expensive sibling to the RR’s flagship Phantom, the Ghost should appeal to “customers who have never had a Rolls-Royce before,” Rolls-Royce CEO Tom Purves told Bloomberg News at this week’s Frankfurt Motor Show. Of course, less expensive is a relative term. With a reported starting price around $338,000, it’s a wee bit pricier — a mere $160,000 — than Bentley’s least expensive sedan, the Continental Flying Spur. But the Rolls is no Continental lookalike. It looks more like cars of the steel-girded, half-a-million-greenbacks ilk, complete with an imposing upright grille, suicide rear doors and a power-retracting Spirit of Ecstasy statuette. The Ghost is smaller, to be sure — some 16 inches shorter than a Phantom sedan — but it should prove to be a sizable presence in any driveway. At 5,445 pounds, it packs nearly 1,000 pounds of additional heft versus a Mercedes S600. That won’t weigh it down, though. Thanks to a 563-horsepower, twin-turbo V-12 and an eight-speed automatic, Rolls-Royce says the Ghost scoots to 60 mph in 4.8 seconds. Inside, the five-seat cabin has a number of influences from Rolls-Royce owner BMW. There’s an iDrive-like controller for the center-dash display, though thankfully, it appears to have the functionality and shortcut keys from the Bavarian’s latest-generation iDrive, which beats iDrive 1.0 like “Top Chef” beats “Iron Chef.” (Oh boy, here come the emails.) As you might expect, wood and leather abound, with cowhides cut from bulls that roamed in barbed-wire-free fields. There are plenty of technological amenities, too: Front, side and rear cameras provide fish-eye views around the entire car, active cruise control can bring the Ghost to a full stop in traffic and rear passengers can enjoy their own multimedia system displays. There’s no word on when the Ghost will materialize at U.S. dealerships — a Rolls-Royce representative has yet to return our calls — but we’d expect it to arrive sometime early next year. Stay tuned for more details, and check out the photos below.